Fresh, flavourful, family-friendly, and fantastic food! At each one of my vegetarian cooking classes, you can expect to eat well, laugh well, and learn much. Learn how to make a variety of mouth-watering recipes, how to buy, use, and store ethnic ingredients, and take home advice on how to cook healthy meals without sacrificing flavour. Although my focus in class will be on vegetarian cuisine, I also provide plenty of helpful cooking tips and techniques that can be applied to all aspects of home cooking. Unlock the flavours of truly authentic Indian cuisine! Inspired by my travels in India, this class is perfect for those who love curry but can never make their curries taste "right". In class, I will focus on the key techniques that make vibrant, full-bodied Indian food. Highlights of tonight’s all-vegetarian menu include lentil dahl, fresh green chutney, homemade curry powder, fragrant tomato curry with basmati rice and much more. World cuisine is known for its explosions of flavour, its liberal use of fresh produce, and its cooking techniques that make even simple ingredients taste spectacular. What are the secrets? In this class, I will de-mystify the ingredients and techniques needed to create mouthwatering vegetables, grains, fruits, and legumes. Borrowing inspiration from Asia, North Africa, Central America, and beyond, we will walk away with a better understanding of how to cook well and stay healthy, with a collection of recipes that will WOW our friends and family. Not just a collection of gourmet recipes, this class will teach you the key techniques needed to create soups that are rich in flavour, depth, and body. Learn why so many vegetable stocks are insipid or off-tasting, how to build layers of flavour using simple ingredients, and how to use ethnic foods to enhance the taste of ordinary soups. This is a fabulous class to take as we head into winter. A full soup and bread meal follows. Are you ready to move beyond rice and pasta? In this class we will begin an exploration of ancient, health-giving grains. I will give an in-depth overview of available grains, including purchasing and storing information. Tonight’s all-vegetarian menu will include recipes ranging from gourmet to family-friendly. The menu will change with the seasons and focus on delicious main courses, grain salads, pilafs, soups, sumptuous desserts, and more. Come celebrate! This fun baking class will be a happy haven from holiday stress. My fail-proof recipes cover the range - everything from homemade cinnamon buns and biscotti to chocolate treats and holiday classics. Class will include gift ideas, make-ahead tips, and a few wheat-free and vegan treats, as well as valuable information on getting the best from your favourite family recipes. Samples to eat, and a few to take home. Come discover both exotic and familiar tastes in this exploration of the Mediterranean region. We go beyond Italian pastas and French stews, to explore less familiar recipes from Italy, Morocco, Spain and beyond! 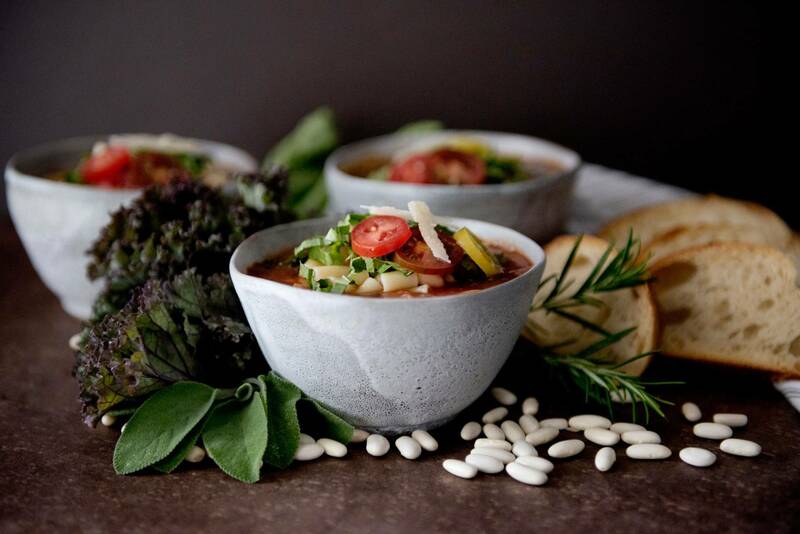 The delicious, seasonal menu includes homemade biscotti, Tuscan white beans with winter greens, Spanish Romesco sauce and North African specialties. Pulses (beans, lentils, peas, chickpeas) are a powerhouse of nutrition and flavor. Those looking for inspiration will be thrilled to join this informative cooking class, where we will learn great tips and delicious recipes for cooking beans from scratch and for getting the most from canned beans. From tips on how best to choose, cook, and store beans, to a variety of fresh and fantastic recipes, this class has something for every bean-lover (and bean-hater!). Tonight’s full vegetarian meal will change seasonally, but can include Rich Black Bean Soup, White Bean Bruschetta, Spiced Chickpea Dip, Kid-friendly Lentils, Decadent Bean Brownies, and more.